Skinks, me thinks, are cool! I like skinks. They look friendly! There is something about their smooth shape and rounded lines that looks more attractive than some other types of lizard. 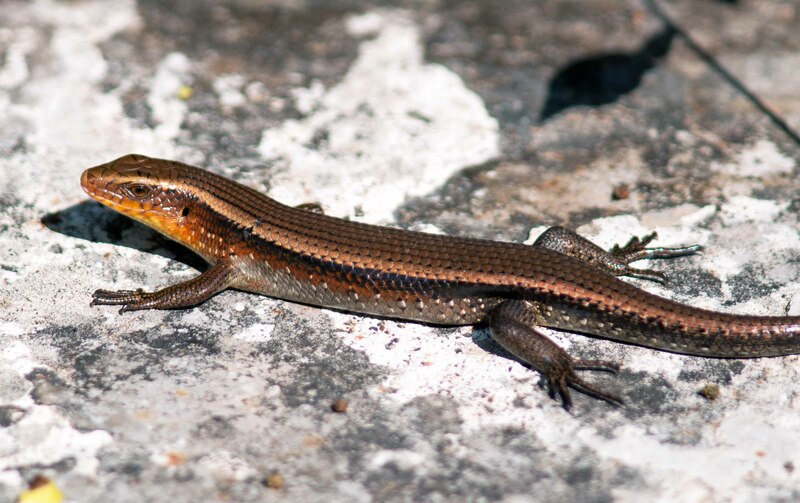 There are more than 1,400 species of skinks; most have cylindrical bodies and short limbs, but others have lost their limbs altogether (or have very reduced appendages). There are skinks with vivid blue tongues, skinks with fat tails (for storing fat), skinks which give birth to live young, and skinks who swim through sand (called sandfish). There are 48 species recorded in Thailand (2), where these photographs were taken. 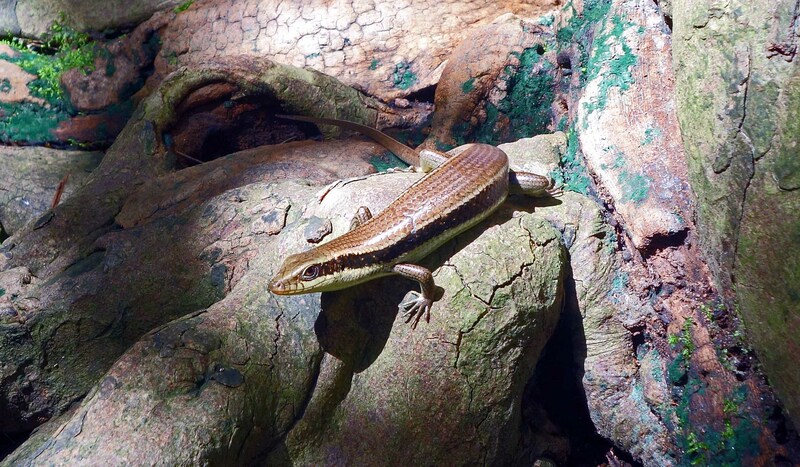 There are sun skinks, tree skinks, stream skinks, forest skinks, legless skinks and so on; the names giving a fairly good idea about the diverse habitats that they occupy. A new (i.e. 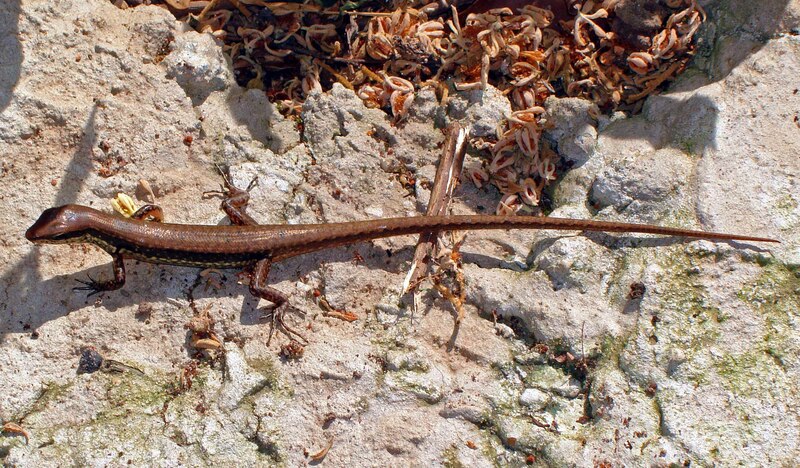 new to science) legless, or rather limbless, skink was found in Thailand in 1972 (1). Perhaps there are others still to find? The Many-lined Sun Skink (Eutropis multifasciata), is a beautiful animal with a lovely bronze sheen and an orange throat (above). They are found throughout Thailand and south-east Asia and are relatively common near human habitation and on the banks of streams. Skinks such as this are terrestrial and feed on insects and other invertebrates. Being cold-blooded, they love to come out into the sun, but are wary of humans and will disappear back into the undergrowth if approached too closely. 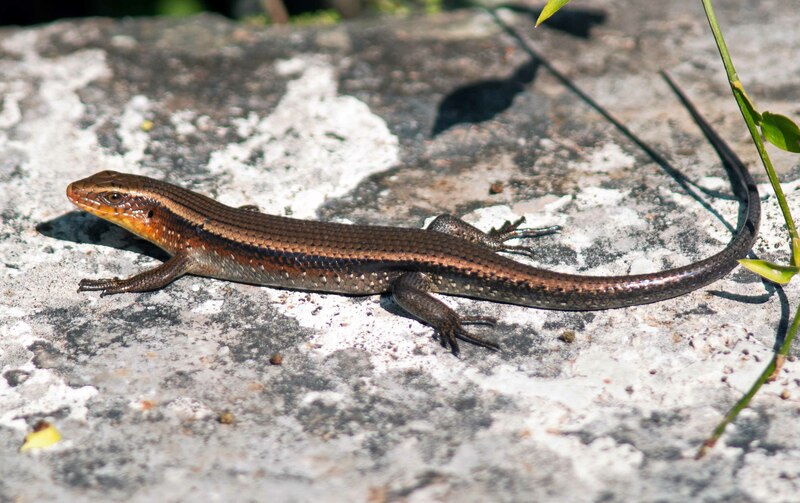 The Long-tailed sun skink (Mabuya longicaudata) is another species which is widespread throughout Thailand. The tail is extremely long, over twice as long as the body, but if it is lost and has to grow back, the replacement – or regenerated – tail is said to be no longer than its body (3). The moral being, if you want a long tail, keep the one you were born with! 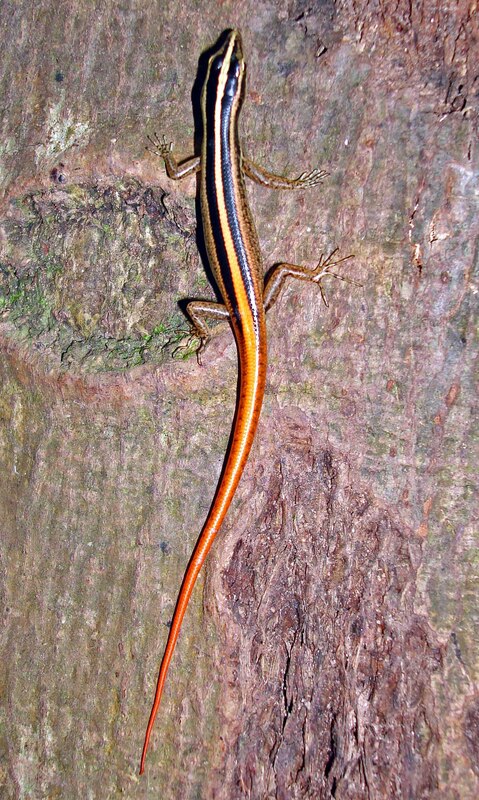 The Striped tree skink (Lipinia vittigera) or Common striped skink, is a pretty little reptile with a beautiful orange tail (above) which is mainly seen on tree trunks, presumably hunting for insects. There are a lot more skinks to be seen and photographed. I look forward to hopefully seeing some new ones on my travels. 2) Tanya Chan-ard, Jarujin Nabhitabhata, John W. K. Parr (2014). A Field Guide to the Reptiles of Thailand. Oxford University Press. Next Next post: A small frog with a big voice! Ray Cannon's nature notes Skinks, me thinks, are cool!